Ive really been getting back into my body care recently... Yup, I'm guilty of being a lazy bum when it comes to body care and it's not until the weather starts warming up abit that I start getting back into having silky soft, moisturised skin, and a great way to start is by prepping your skin with a gorgeous body scrub... 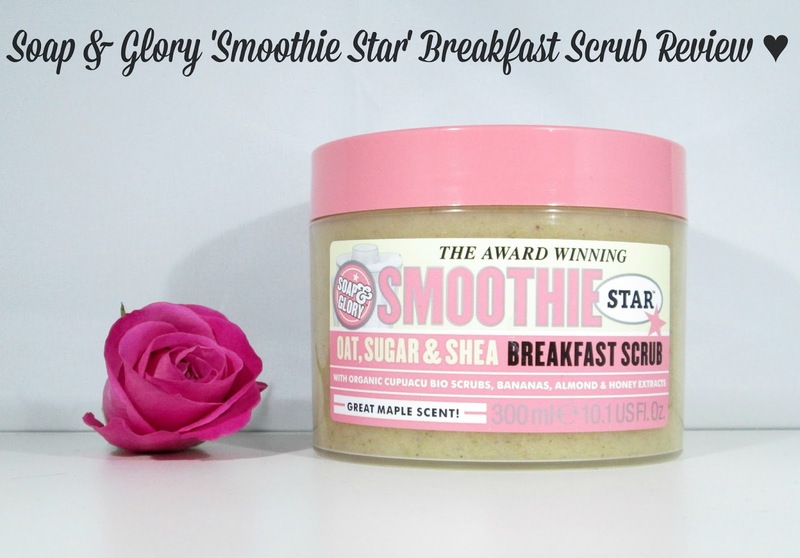 So say hello to Soap & Glory's Smoothie Star Breakfast Scrub! 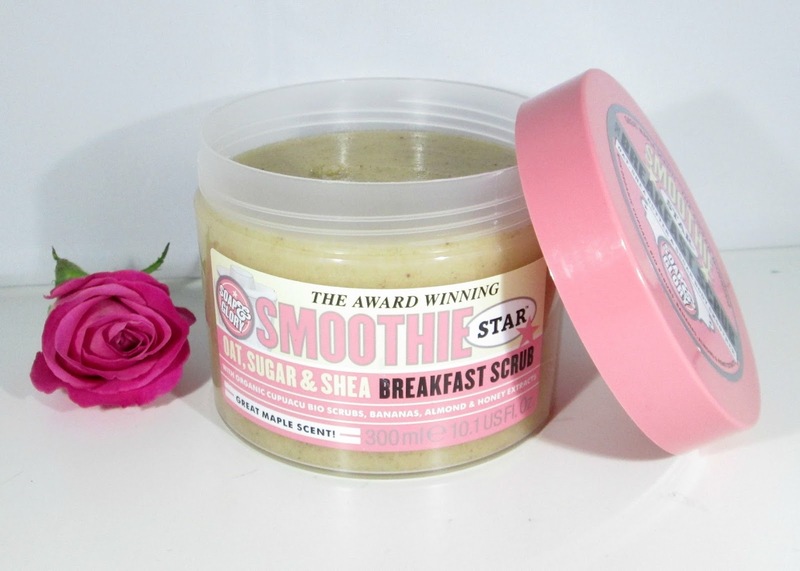 Soap & Glory's Breakfast Scrub is part of the award winning 'Smoothie Star Collection' which consists of a Body Milk £10.00, Body Buttercream £10.50 and of course the Body Scrub £8.00 which is what I'm reviewing for you all today. I must admit the Breakfast Scrub has been a favourite of mine for years so I noticed straight away that they've renamed it slightly by adding 'Smoothie Star' and changed the packaging too, not to mention they've now added an all new maple fragrance, yum! This must of happened quite recently as it wasn't like that the last time I bought a tub. Anywhooo... Let me start by saying how amazing the Breakfast Scrub scent is.... Honey, banana, golden sugar, natural cupuaçu bio scrubs (from the cupuaçu tree, part of the cocoa family), oatmeal, almonds and shea butter are all ingredients that make up this scrub and oh my goodness, just imagine the smell of yummy pancakes in the morning drizzled with either golden syrup or maple syrup and wham, that's your scent! It literally smells so good I could eat it, don't worry as temping as it is I have not tried it ha ha. The breakfast scrubs consistency is quite thick and slightly sticky at first but is fine once you work it over your skin, and is crammed full with the perfect sized scrub granules, I am usually quite fussy when it comes to a body scrubs texture, I don't like them to be too abrasive so that your skin is left all red yet a like it slightly gritty so you can actually feel it doing something and Soap & Glory have it spot on, it mostly feels like sugar granules with some sea salt granules popped in for good measure, it just feels like what I expect from the perfect body scrub to be honest. The way I like to use the scrub is by getting a small handful of the scrub, rub it between the palms of my hands and then rub in circular motions all over my damp skin, paying attention to my most dry areas like my knees and elbows etc. As I said before the scrub does feel slightly sticky when you first get a generous handful out of the tub but as it washes off it turns into what I'd call a milky formula. Afterwards my skin feels super soft, perfectly polished and smelling insane, yup that gorgeous scent does linger on your skin aarrhhhh!! Overall I absolutely love this scrub and will definitely continue to repurchase over and over. It's great for prepping your skin for summer or if you need a good exfoliate before fake tanning this would work amazingly. I also love that the breakfast scrub doesn't over exfoliate nor does it dry my skin out with is a major plus, it's just perfect. You can get a massive 300ml tub of the 'Smoothie Star' Breakfast Scrub for £8.00 from Boots and Soap & Glory are always on a 3 for 2 offer too so you can really indulge if you like! 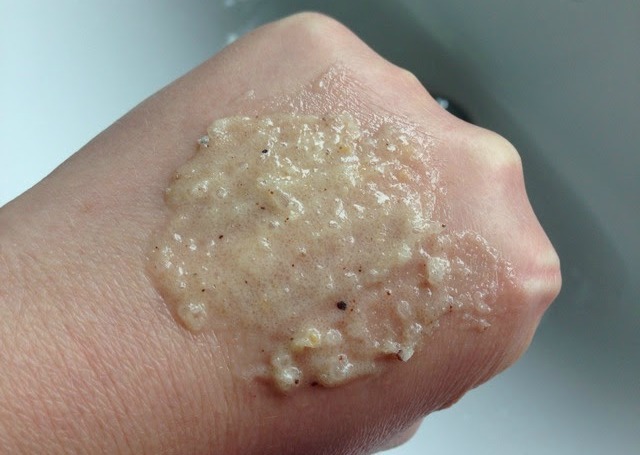 Have you tried this gorgeous scrub?? What did you think?? I'd love to know! This is such an amazing scrub! One of my faves! This isn't a scrub I've tried because I'm a huuuuge and loyal fan of dry scrubs! They're great, but I have been looking at the S&G ones to branch out and expand my collection. I've always loved S&G, the packaging is gorgeous and I love their witty names. This could be the scrub for me!